The Famous Tram 28 And A Few Last Stops. 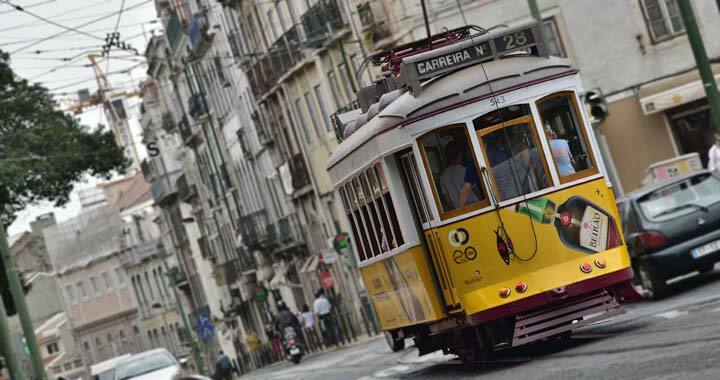 The delightful Remodelado trams date from the 1930s, and in any other city they would be housed in a museum, but in Lisbon, they are an integral part of the public transport network. These historic trams are still in use, as the 28 route is completely unsuitable for modern trams, due to its numerous tight turns and steep gradients. Once we were done with lunch and Col was done with picking the bones from her teeth it was time to hop on the Tram to see a part of Lisbon that we had yet to explore. The inside of the Tram still has the original wood and you can tell that it is well taken care of. Mine is the shrimp salad with the tomatoes in it, so……. Col’s Cod Fish is naturally the other one. We had no idea that we were going to come across this Basilica on the Tram route and believe me we have seen our share of Churches already, but this turned out to be one of the best. We were glad we stopped to take a look. This was just a picture of an Arch that I thought was nice. We came across this Old Baba hanging her laundry so I thought it would make for a good picture. Finally, by far the best value in Lisbon was this one litre box of wine that we could purchase for about $1.40 Canadian. We only purchased one box (today). Our first organized tour in Portugal. Actually, our ONLY organized tour in Portugal. And, the only reason we took this tour was that we could find no other mode of transportation that would take us to these spots inexpensively. So, off we went to meet our small group tour at the corner of the Square by the Hard Rock Cafe. There were eight of us plus our driver/tour guide. We were the only Canadians – the rest were Americans from Colorado, California, Texas and Tennessee. A great group and our guide was funny and informative. An hour and a half on the road north of Lisbon and we were in Fatima. For those that do not know the story, the simplified version is this: The Virgin Mary appeared to three children on May 13, 1917 and reappeared on the 13th of every month thereafter for six months. Because of this apparition, a shrine and a basilica were built on the site circa 1920. In 1967, 50 years after the first vision, one and a half million people gathered in the square to worship. This is now the fourth biggest Catholic pilgrimage site in the world. A new Basilica was built in 1996 but the original one dominates the square and daily masses still take place there. We were lucky enough to catch part of the mass, listening to the large pipe organ filling up the large sanctuary. Another beautiful work of architecture! As a side note, we have been in a number of churches in Lisbon and though they are not as flashy or colorful as the churches in Italy, they are magnificent nonetheless. Large with high ceilings, beautiful side chapels and ornate statues, these churches are beautiful in their simplicity. After lighting a few candles for our friends and families back home, we got back in the van and headed for the 14th century Monastery in Batalha. This monastery is an example of Gothic architecture and took a century to build. In fact, it never was finished. There are still a number of chapels in the back that do not have roofs. For anyone that has read the book, Pillars of The Earth, this is the church that I would imagine Tom Builder was working on. It is absolutely splendid and again, the artisans of that time were hugely talented. You will see the workmanship on the twelve apostles that line the entryway on one or two of the attached pictures. Still in awe from the size and beauty of this monastery, we headed for the small coastal fishing village of Nazare. Nazare was a fairly obscure vacation resort town for the local Portuguese people until 2011 when a surfer dude from Hawaii set the world record there for surfing the largest waves ever recorded. Since then, surfers and vacationers alike come to Nazare to enjoy the sun, sand and surf. Although the sun tried to peak out from behind the clouds, the lack of warmth did not stop us from appreciating the large sandy beaches and the roaring surf below the rocky outcrops. It is totally understandable how this has become a very popular vacation spot. We had lunch in one of the small restaurants in the village. The proprietor (who lived in Canada for about 20 years – too cold, he said), goes to the seaside every morning to pick out his fish for the day. A couple of the girls in our group tried the red snapper, one had squid, another couple shared some crab, Richard had swordfish and I had….well, steak. Let’s not kid ourselves – I am still not enough of a fish lover to try something that was still alive that morning. Everyone thought their meals were great – all with a little taste of Portugal. Side note: Col actually had about a third of the swordfish. She is just too humble to mention it. Our last stop of the day was the medieval village of Obidos. This village has been well preserved since its inception and other than the odd car driving down the narrow streets, you feel like you have taken a walk back in time. The entire village is surrounded by a wall and includes small shops and residences along the street, a large square where a medieval festival is held each year, churches and a castle which is now a hotel. Richard and I walked along the top of the wall and unlike other castle walls that we have walked on, this one has absolutely no safety railing. A couple of times I thought that I was suffering from vertigo but chose not to look down. It may not have been that far but I am sure that the ground would have caused some damage if I had succumbed to dizziness and gravity. Anyways, we both made it safe and sound back to the street and celebrated our victory over death with a shot of Ginga and chocolate. We arrived back in Lisbon about 6:30, walked our 20 minutes home and spent the evening doing laundry and getting ready to leave for Barcelona. Today is our last day in Lisbon and we have enjoyed it immensely. We enjoy staying in one place long enough to experience the culture and hope that we will be able to do more of that as we travel through Europe. Our next post will be from Barcelona, Spain. Until then, Stay warm, my friends. Below is the original chapel. There is actually a piece of the Berlin wall at Fatima. Of course no meal in Portugal is complete without a shot of Ginja. Last stop of the day. The village of Obidos. Our tour guide brought us to a place where we sampled homemade Ginja. Oh, and of course we could purchase some if we wanted to. Another thing I do not like about organized tours, you always seem to end up at some prearranged place for a free sample of something that you can purchase. Oh well, we are getting better at it. We had our two free samples and skedaddled out. We left our Airbnb in Rome around 10:30 AM and headed for the train station, jumped on the iron horse that was pointed towards Napoli. That’s Naples for those of you who are not Italian. Our Airbnb here is again right in the heart of the old city which means we are walking distance to all the real cool sites, sounds and smells. After settling in we wandered out for a walk and being that Napoli is the birthplace of Pizza we had planned to stop at Pizza Di Matteo which was recommended by our host. Of course after supper we stopped at a little side cafe for ice cream and an espresso. Napoli has a real good vibe to it. It is not Rome, but then again Rome is not Napoli. It has more of a relaxed feel to it and the whole place where we are is like one giant outdoor food court, but of course with an Italian flavour. Pastry shops, cafes, pizza and whatever else you can think of. Tomorrow we head to Pompeii to see the sights there. Ciao…. This is what greeted us as we came out of the subway..
Our Pizza in the town where it was invented. It is different from what we have in Canada, but it was very good. One thing that was different was that it was not cut into pieces when they brought it to us. We were not sure what to do with it until we saw a couple of guys next to us tearing pieces off with their hands and rolling it up. It was almost like eating a crepe….. I saw this little statue and I wanted to take a picture and post it. The reason is that as we were walking down the street I noticed a lot of the couples were either kissing or cuddling. Well, like the song says. THAT’S AMORE…….